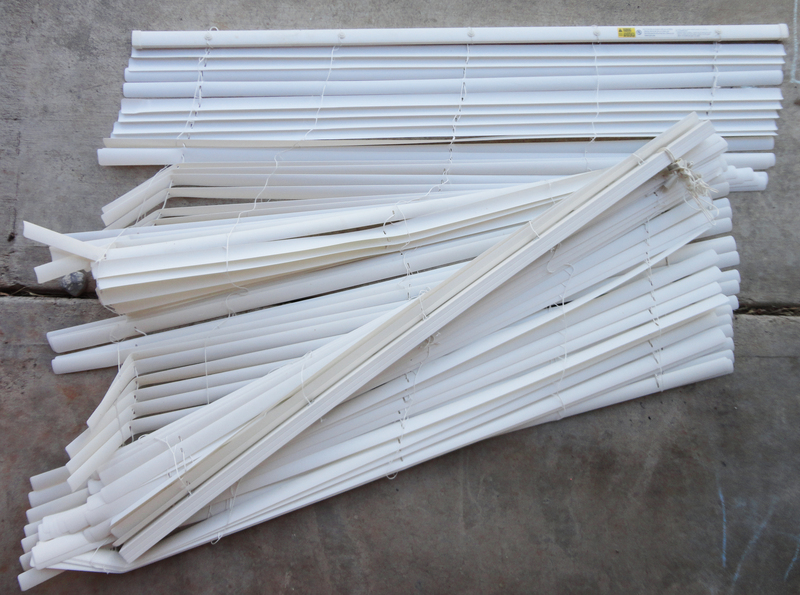 When we moved into our house, the blinds that were there did their job well- until the kiddos pulled them down. There was not a good way of fixing them and they were many pounds of waste to throw out. I knew there had to be a fun and functional way to upcycle them. 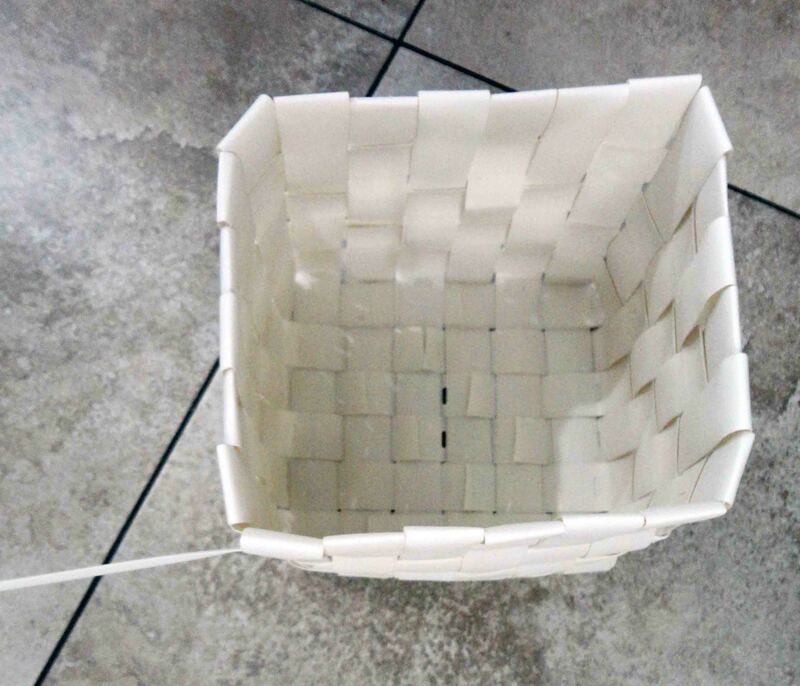 That’s when I came up with this project: The Mini Blind Basket! 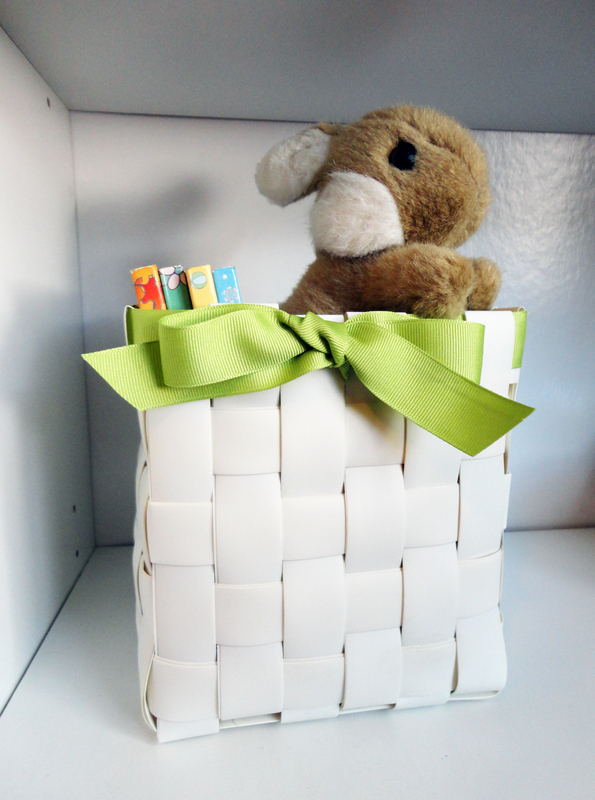 It is super handy for storing small items on a shelf, and it can be dressed up with a ribbon. 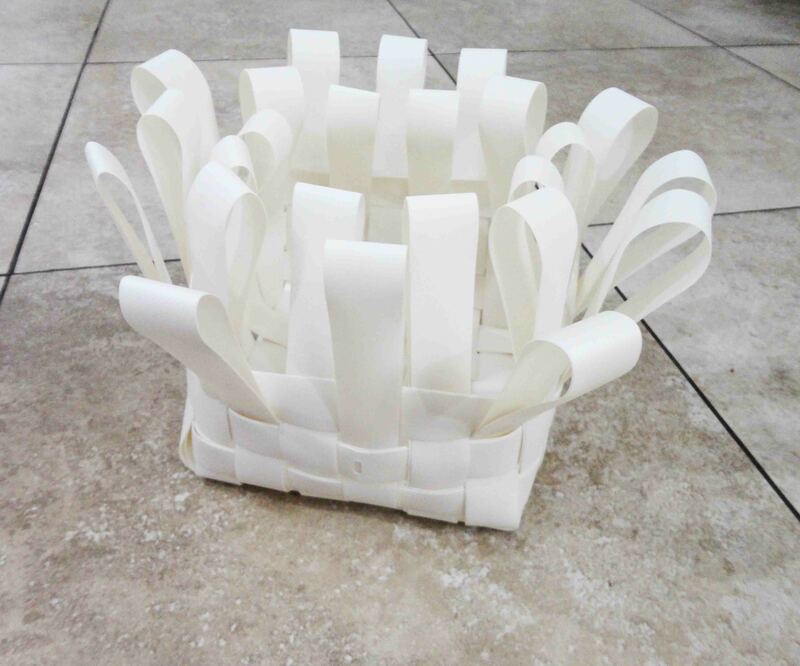 Below are some guidelines I developed while creating my own set of Mini Blind Baskets. Please use them to fuel your own creativity and help you create your own project. 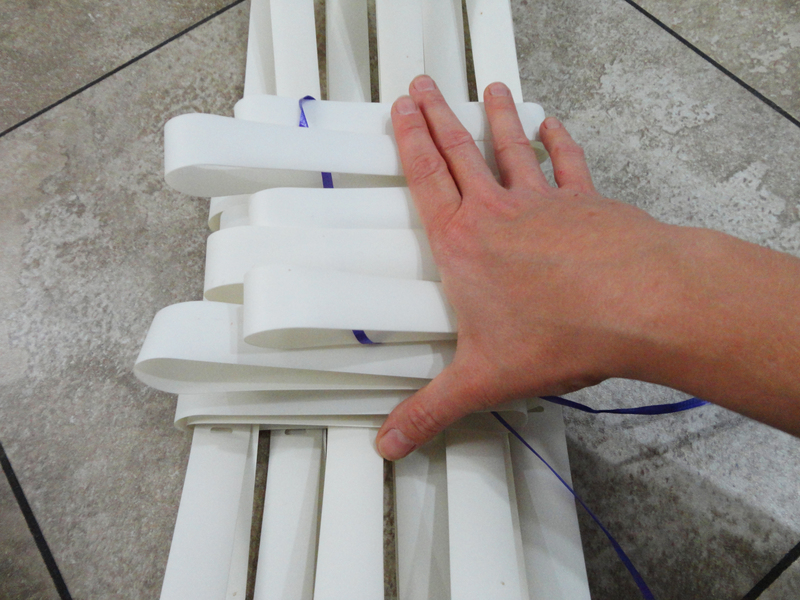 1) Using mini blinds that had three holes each, I ran some found curling ribbon through the middle set of holes on 6 individual blinds. I made sure that they were curving upward. 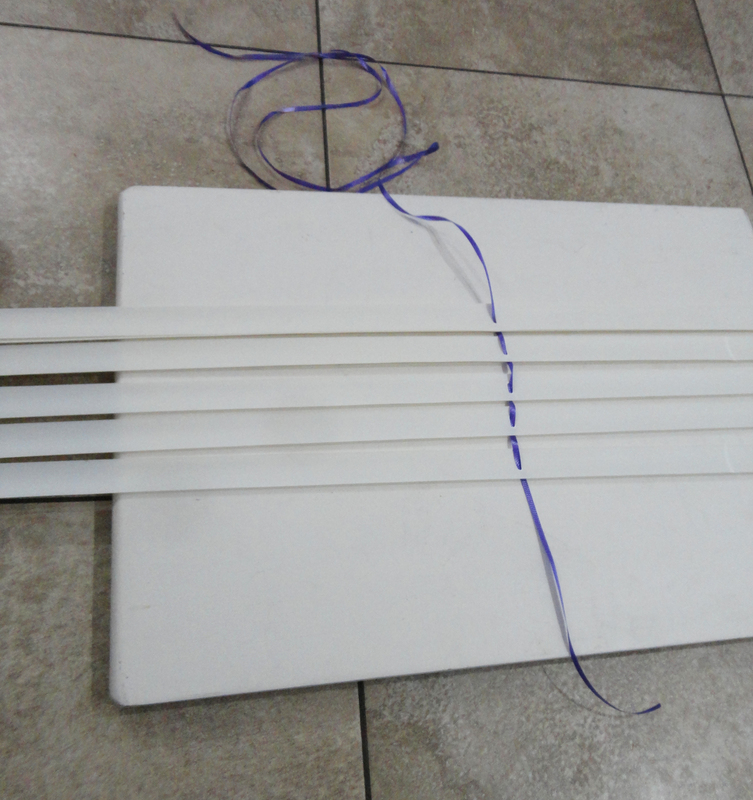 2) I placed the set of 6 on a board and tied the ribbon together on the back of a found board that was wide enough for them. 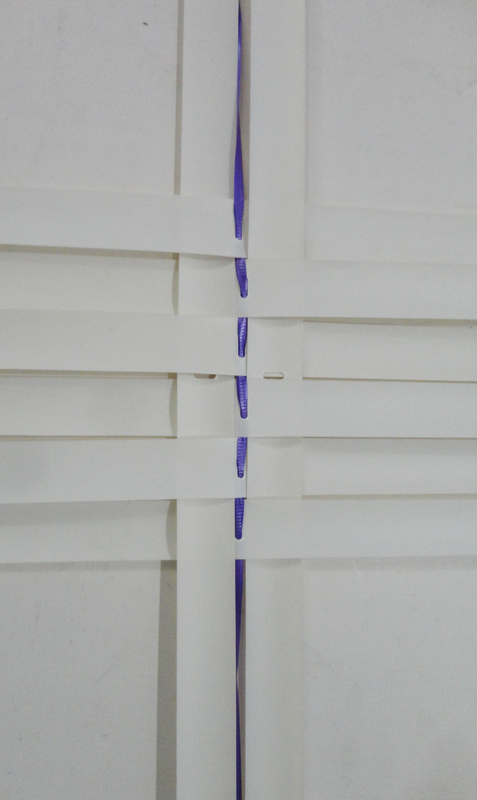 3) I wove additional blinds parallel to the ribbon, opposite to eachother, while lining up the holes in the middle. This set was also made up of 6 blinds. 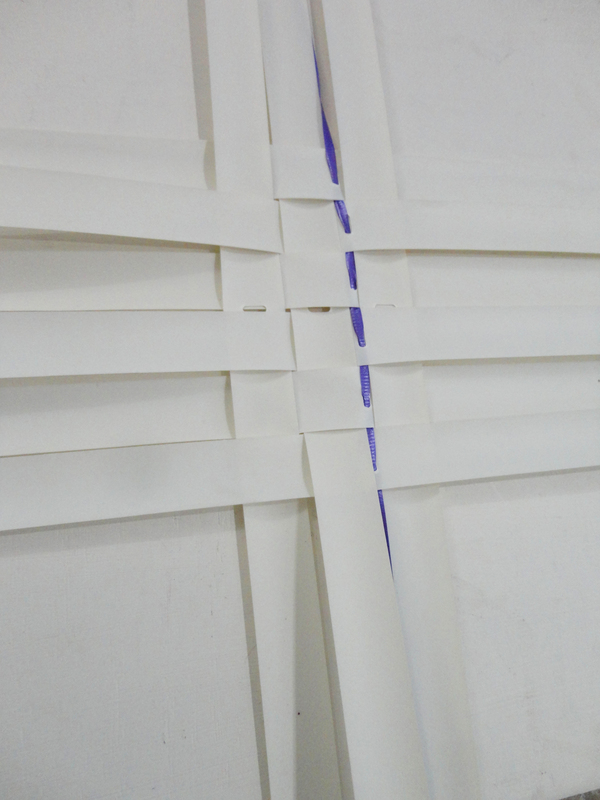 Keeping the blinds curving upward, I placed three on each side of the ribbon. 4) The end of each blind got woven into the middle, up to the outer set of holes. I followed the weaving pattern that was already established. Once I felt the ends were firmly tucked in, I trimmed the remainer. I completed step 4 for all four sides. 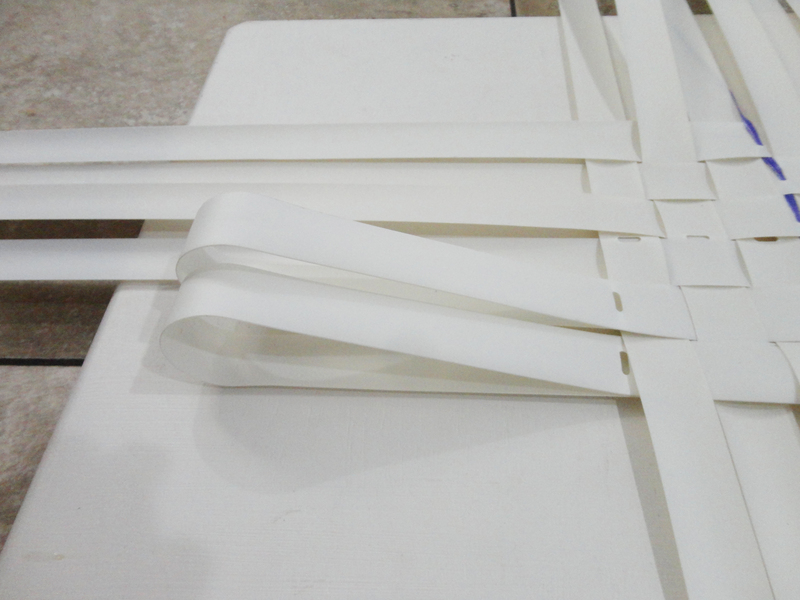 5) I threaded the resulting loops with more leftover curling ribbon on one of the four sides. I bent the sides over at their set of lined up holes, and then bent the opposite group in the same way. 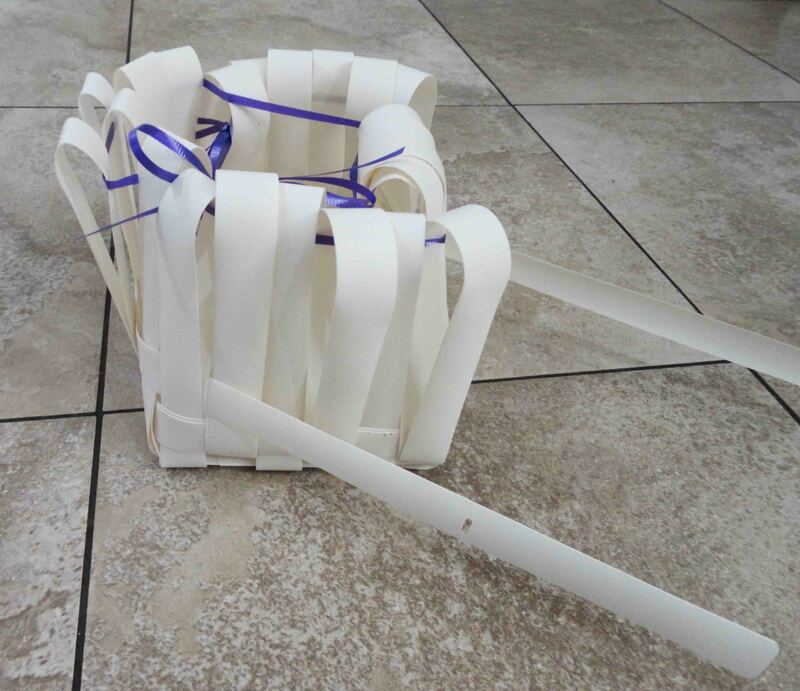 6) I used the ribbon to tie the two groups of loops upward. 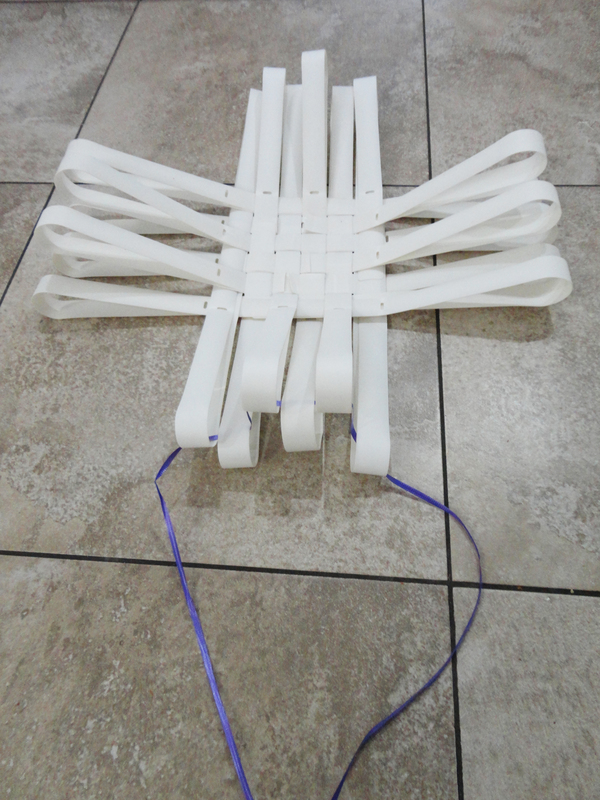 I repeated the bending and tying with the other two sides. 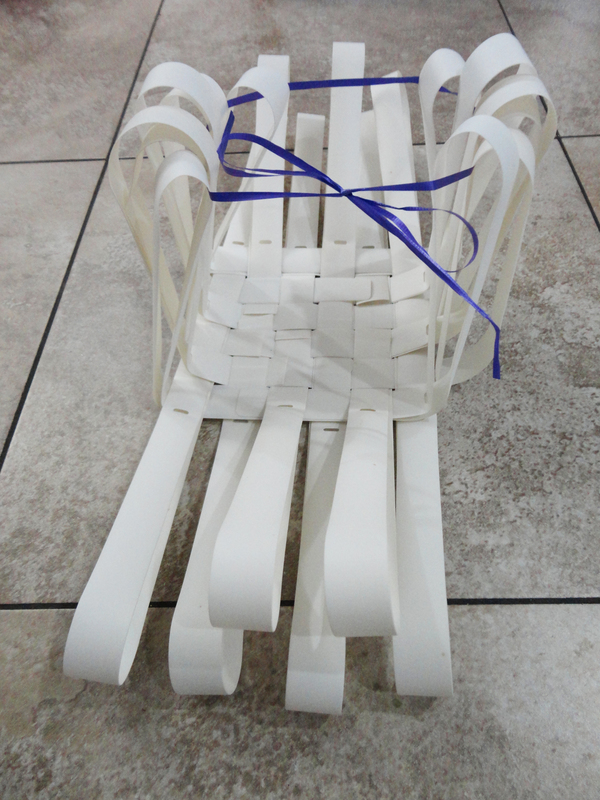 7) I started to weave the basket upward by weaving one blind along the base. 8) Weaving opposite, I contunied to weave upward, shaping it as I went. Each blind I added created it’s own layer. This required weaving the blind on top of itself in order to make it tight. 9) When I got near the top, I used the last blind-width to thread a blind through the center of all the loop tops. 10) I wove a colorful ribbon through the loops and tied it in the front. Tip: Mini blinds are a bit slippery to weave with. Shape and tighten as you go. Upcycling is just one way that I fight autism. Another way is finding new homes for found fashions. Visit my ebay store, Up Pix Studio. 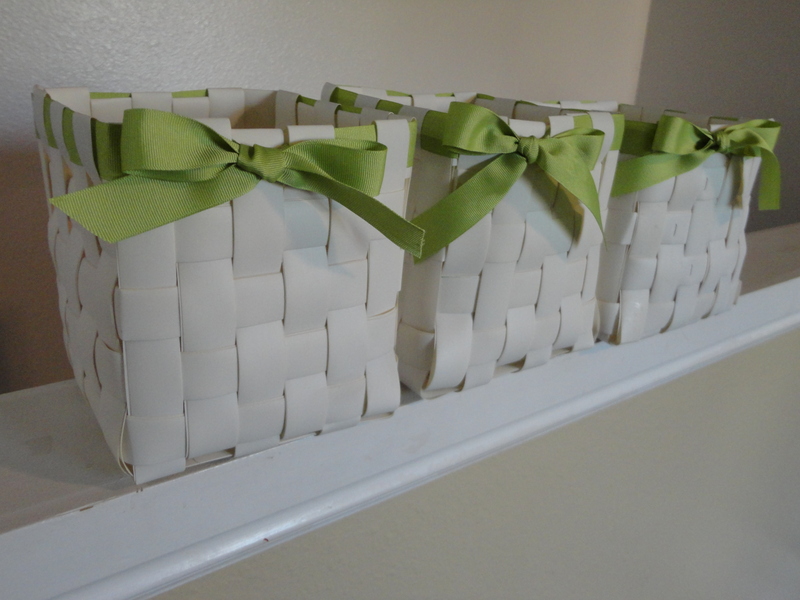 I love how cute these baskets turned out!